This article was originally written by Douglas Trattner and published on Cleveland Scene on May 2, 2016. 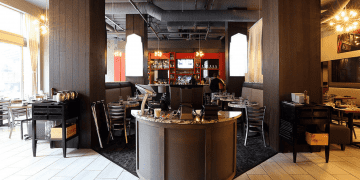 Although the Kimpton Schofield Hotel, located at East Ninth and Euclid Avenue downtown, has been open for about a month, the flagship restaurant within is still getting buttoned up. “We’re about three weeks to a month out,” says executive chef Andrew Gorski. 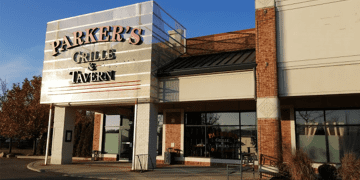 The restaurant, Parker’s Downtown, is an offshoot of Parker’s Grille & Tavern in Avon Lake, which is operated by James and Victoria Mowbray. The downtown location is a 4,700-square-foot, two-level, 120-seat restaurant that will provide food service to walk-in customers, the complex’s 122 hotel rooms and, eventually, 52 luxury apartments upstairs. “We are not affiliated with the Kimpton, we just happen to be in the same building as the Kimpton,” Gorski explains. Since graduating from the Culinary Institute of America in 2007, Gorski has worked at David Burke at the Venetian, Thomas Keller’s Bouchon and MIX Alan Ducasse in Las Vegas. He has worked on and off over the past three years at both Butcher & the Brewer and Tremont Tap House. 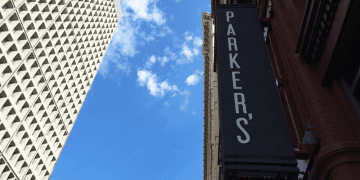 While the food at Parker’s Grille is pretty conservative and family friendly, Gorski and his team intend to push the envelope a bit more downtown. Billed as “Progressive American,” the menus feature foods that are Midwestern at heart, but tweaked and elevated in terms of ingredients and technique. Dinner starters include smoked whitefish served with warm sourdough, potato pierogi garnished with crème fraiche, pistachios and pear, and lamb meatballs with Korean red pepper paste. Main courses might include smoked pheasant with grilled peaches, polenta and port, chicken pot pie with creamed leeks and wild mushrooms in puff pastry, and mac & cheese with gruyere, smoked ham and veal jus. A separate bar menu is loaded with cocktail-friendly snacks like shrimp cocktail with horseradish custard, sliders with caramelized onions and 1,000 Island, salumi flatbreads and pickled eggs. Breakfast offers both staples like omelets, waffles and eggs Benedict as well as more creative fare like flat iron steak and eggs, a Croque Madame with smoked ham, gruyere and a fried egg, and house-cured gravlax served with cream cheese, pickled shallots, capers and bagel chips. Lunchtime is heavy on the soups, salads and sandwiches, with items like cauliflower soup with King crab, beet salad with whipped goat cheese, Korean fried chicken sandwich, a Cleveland-style Cuban starring shaved bologna and Stadium Mustard, and porchetta with celery root slaw and buttermilk dressing. Down the road, Gorski will add wine dinners and tasting menus into the mix.